Ridley Scott takes a stab at going traditional noir with Someone to Watch Over Me, starring Tom Berenger as a blue-collar NY cop who falls for his upper-crust Manhattan murder witness Mimi Rogers. There are moments of smart family drama, but a lack of chemistry between its stars and tepid urgency keep the thrills at bay. Shout Select brings this 80s thriller to Blu-ray for the first time with a solid A/V presentation and a couple of worthwhile bonus features. It's not among Scott's best efforts, but Someone to Watch Over Me is something that's Worth A Look. Special Features: NEW interviews with Writer Howard Franklin and Director of Photography Steven Poster. 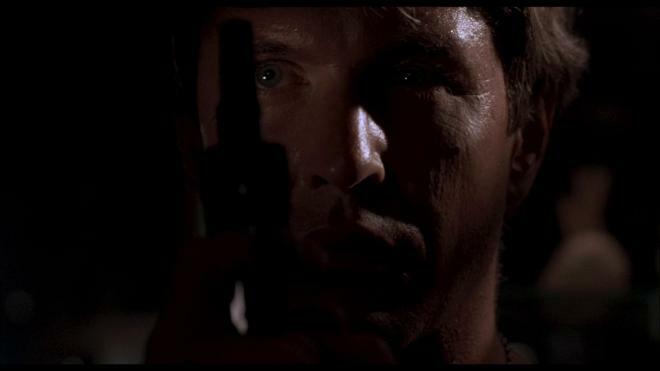 Tough family man cop Mike Keegan (Tom Berenger) just made the big time. Passing the detective's exams, he's been promoted up to Manhattan. His first assignment is a doozy. Socialite Claire Gregory (Mimi Rogers) just saw mobster Joey Venza (Andreas Katsulas) murder a man in cold blood. Now a target, Keegan is assigned as her night protection detail. As Venza threatens Claire's life, she and Mike get closer endangering his career and estranging him from his wife Ellie (Lorraine Bracco) and his young son. Someone to Watch Over Me is what I like to call a "middle movie" for Ridley Scott. It's a movie that was made in the middle of two much better movies, in this case, Legend and Black Rain. It's not that Someone to Watch Over Me is a "bad" movie, but compared to the visually arresting and impressive films he'd made up to that point, it's a bit of a letdown. While not my favorite of his films, it's one I return to every so often and genuinely do appreciate. At its core, Someone to Watch Over Me is a family drama about a man dissatisfied with his life and experiences the fresh excitement of a world he rarely gets to explore. Hot off his turn in Platoon, Tom Berenger delivers another great performance as Mike. He's in way over his head with his new assignment, but he's not happy with where his life was going. Rogers' Claire is one of the few people to genuinely take him seriously as a cop and as a man who understandably wants more out of life. The problem with getting your dream, it often turns into a nightmare. The traditional cop thriller story elements play second fiddle to Mike's personal drama - and that may be this film's undoing. While fine in their respective roles, there is a decided lack of chemistry between Berenger and Rogers. You never really see them as a viable "item" outside of the circumstances they find themselves in. It doesn't help that Lorraine Bracco offers up a spunkier charismatic and attractive performance. Berenger and Bracco are a much more natural fit together making you ask the old Paul Newman quote: "Why go out for burgers when you've got steak at home?" When the thriller elements kick in, the flick finds enough steam to keep rolling along. 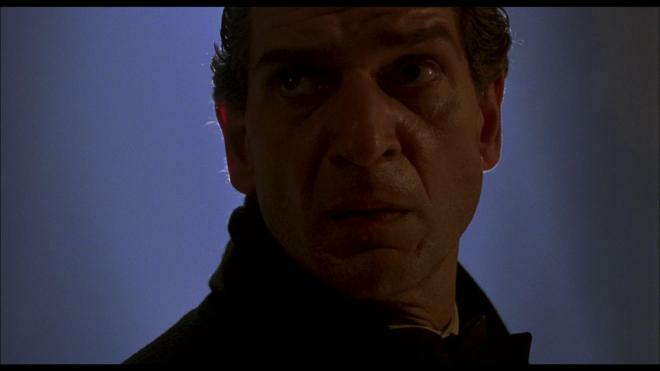 Andreas Katsulas delivers a chilling bad guy - even though he may be more famous as the One-armed Man in The Fugitive. He's in fine form as the murder-prone Venza and even though he only has a handful of scenes, his grim stature makes him a constant threat. Not the worst Ridley Scott film, not the best, it's a true middle effort. Entertaining while it's on, Someone to Watch Over Me doesn't leave a lasting mark to be memorable once the credits roll. It's a beautiful flick to look at. For Scott's first contemporary film that wasn't science fiction, period, or fantasy it's a visual love letter to 1980s New York. Take a gander at it for yourself. Performances are great, the movie looks great, and when the thriller works it works well. Shout Factory delivers Someone to Watch Over Me to Blu-rya in a single-disc set as part of their Shout Select line with spine number 69. Pressed onto a Region A BD-50 disc and housed in a standard Blu-ray case. The disc loads to a static image main menu with traditional navigation options. I can't swear by the vintage of the 1.85:1 1080p transfer supplied for this Blu-ray release of Someone to Watch Over Me, but it looks to have been fairly recent as the image ticks off the major grades with strong results. Film grain is intact and finely rendered leading to nice detail levels. Facial features, the 80s clothing, and decorations all come through with great clarity. The busy party scenes offer some impressive details in the design and costumes. Colors are bright with strong primaries - especially the previously mentioned party sequences. Black levels are strong with a nice inky presence with appreciable shadows. There are a few hazy moments where blacks aren't quite as strong and the image can be a bit flat - it looks as if the frame was zoomed in as grain is also a tad thicker during these moments. This isn't a serious distraction but it's noticeable. For a lower tier Scott film, this one makes a fine presence on Blu-ray. Someone to Watch Over Me arrives with a DTS-HD MA 2.0 mix that is a tad bit on the soft side. As a whole this mix is fine, it's just starting out you may need to pop up your levels a few extra notches than you'd normally run. Once you've got the show at a comfortable listening level, you're good to go. Dialogue is clean and clear throughout. Sound effects are present, giving the mix plenty of natural atmosphere for a stereo mix. Gunshots have that exaggerated booming quality giving the track some nice LFE. Scoring, by the late great Michael Kamen, is solid material and fits nicely with the rest of the film. While the bonus feature collection for Someone to Watch Over Me may not be the most robust package ever assembled, the material here is pretty good stuff. The new interviews with writer Howard Franklin and director of photography Steven Poster give insight into the making of the movie. I'd have loved a Ridley Scott audio commentary, as his are usually top tier listens, but these two interviews are nicely informative. NEW Interview with Writer Howard Franklin (HD 10:41) great interview detailing the changes between the script and the final film. NEW Interview with Director of Photography Steven Poster (HD 14:04) If you want to learn A LOT about lighting, this is an AWESOME interview! 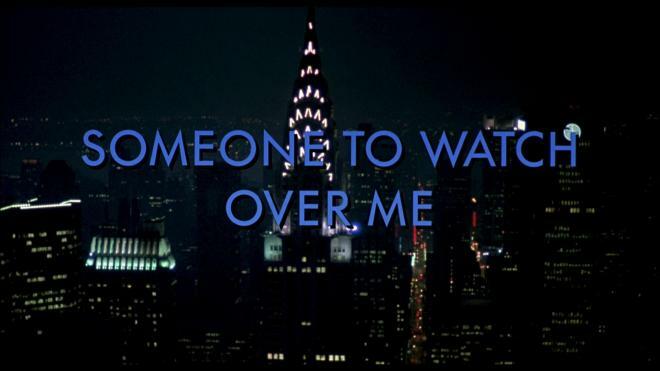 Someone to Watch Over Me isn't one of Ridley Scott's best films - nor is it a particularly great thriller. It's entertaining and holds your attention, but some of the overstuffed dramatic bits and some lacking chemistry undercuts the tension building. Solid performances and stylistically beautiful, it's a middling effort but a worthy watch. Shout Select brings Someone to Watch Over Me to Blu-ray with a solid A/V presentation and a couple of worthwhile interviews to round out the bonus features package. If you're a fan or a Ridley Scott completionist, this is a good release, if you're new to the film it's Worth A Look.